While the Heuer Monaco and Silverstone are often the first thing that come to mind when thinking of vintage Heuer watches with connections to motorsport—and likely the Siffert Autavia as well—the brand has a long history of commemorating the world of racing through a wide range of timepieces though the ‘60s and ‘70s. 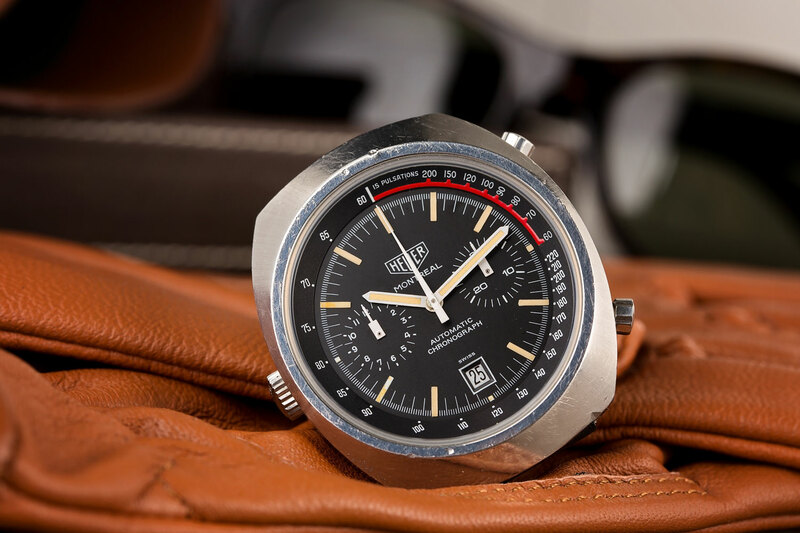 The Heuer Montreal first appeared in catalogs in 1972, powered by the venerable Caliber 12 movement and boasting similar aesthetic codes to its fellow racing-centric siblings. Here is the Heuer Montreal. A watch created with the racer in mind. Though one might be quick to think its name traces its roots to the Montreal Formula One Grand Prix, that isn’t actually the case. From 1967 to 1977 inclusively, the Canadian Grand Prix took place outside of Toronto at Mosport Park, before being moved to Montreal in 1978. Though a formal answer has yet to be uncovered, the speculation is that the classy Montreal collection was named in celebration of the city’s selection as host of the Olympic Games, slated for 1976. 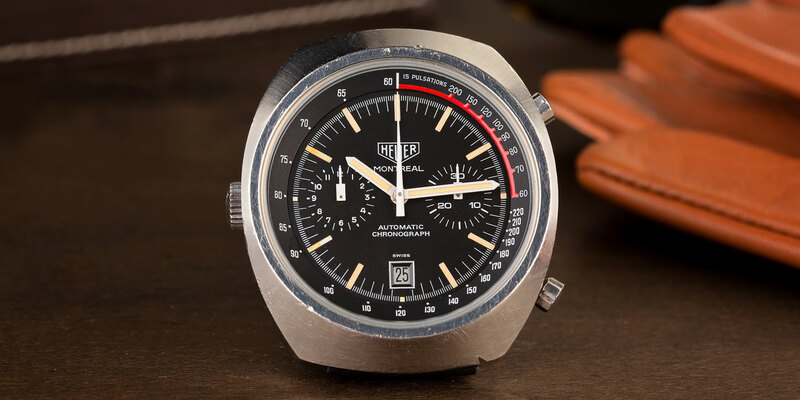 Nomenclature aside, the Heuer Montreal was a racing chronograph through-and-through, though its lack of celebrity connection and relatively short production run (discontinued in 1983) make it a prime candidate for future collectability. 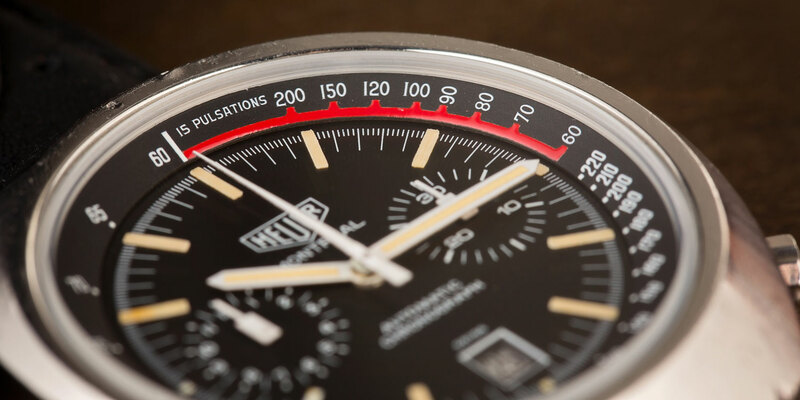 This Heuer Montreal 110.503NC will soon become a collector’s item. From a design standpoint, there’s much to love about the Montreal, especially in this specific configuration. The 110.503NC Black (produced in 1974) has a matte black dial complemented by white indices and a red pulsations scale from 12 to 3 o’clock. As with many Heuers of the day, its luminous indices have developed a fairly uniform light cream-colored patina. Being powered by the hand-wound Heuer Caliber 12, the Montreal has fluted pushers on the right side of the case, and a semi-recessed crown on the opposite side at 9 o’clock. As many Heuer fans will tell you, this relocation of the crown makes the Montreal (and other Heuers of the day) much more comfortable to wear—especially for those who like to wear their watches a bit loose on the wrist. The case of the Heuer Montreal seen here has clearly seen a bit of wear and tear over its 44 year lifespan, though that isn’t a bad thing. Looking closely, the original radial brushing appears to be intact, and given the sharpness of its edges—most noticable from the back of the case on either of its flanks—we can safely say this Montreal has not been polished to death by any stretch of the imagination. Here is a detailed shot to see its hint of red. What makes the Montreal more appealing than many watches from its day comes down to case size. Though a few brands were starting to offer watches in larger cases by the early ‘70s (the Omega Flightmaster instantly comes to mind), The 42mm lugless case of the Montreal is simply one of those prime sizes that manages to be a perfect fit regardless how large or small its wearer’s wrist may be. I can’t remember how many times I’ve heard people say “I love the look of vintage watches, but they’re all just so damned small!” Thankfully the Montreal doesn’t fall into that category. There’s no arguing that TAG Heuer is still on a bit of a vintage kick with their product design, as is much of the watch industry of late. Having already launched reissues of the Monaco, Silvestone, and more recently the Monza and Autavia, there remains much speculation about what’s to come as we creep towards Baselworld 2018. Will this be the year of the Montreal reissue? Though it would be a slightly obscure choice, we wouldn’t rule it out either, and if it does you can expect to see at least a slight bump in the market values of offerings like this one.